MR. HEALY: In these sittings, Sir, the Tribunal plans to deal with two main classes of material. Firstly, the company with which Mr. Conor Haughey was associated and which was known as Feltrim, now in a new incarnation as Minmet PLC. And the second item concerns Princes Investments, a company associated with Mr. John Byrne and which appears to have had connections with the operation by the late Mr. Desmond Traynor of the Ansbacher accounts and which is germane to the Tribunal’s consideration of the operation of the Ansbacher accounts. It will be recalled that the Tribunal’s investigation into the overall manner of operation of those accounts took up a large portion of the last sittings of the Tribunal. A further item which has not been mentioned at all, not even in passing in the Tribunal’s evidence to date, is a payment rooted through a Far Eastern company known as Wytrex and which appears, on the information available to the Tribunal, to be a payment with which Mr. Ben Dunne and the Dunnes Group was associated. The second main part of the Tribunal’s sittings will involve revisiting a number of areas where a significant amount of evidence has already been given. Now, the material in this second class can be divided into a number of subdivisions and the first subdivision concerns two matters which have already been mentioned, but in respect of which an amount of additional evidence is now going to be led, both because some of that evidence was not available at the time that these matters were last mentioned in the course of the Tribunal’s sittings, and also because it was not possible, for practical reasons in some cases, to lead some of that evidence on earlier occasions. The evidence concerns firstly payments made in connection with the discharge of the medical expenses of the late Mr. Brian Lenihan; and secondly, the transfer of funds or the making of payments in connection with the operation of NCB Stockbrokers account known as Aurum Nominees. The second subdivision concerns a review of activity on one of the Amiens related accounts, Amiens Securities Limited No. 1 current account 10407014. Considerable evidence has already been given regarding this account and the Tribunal now wishes to examine material relating to a number of very substantial lodgements to this account in 1987 and in 1988. Because of the evidence already given, which appears to connect this account with payments to, or for the benefit of, Mr. Haughey, it may be that these lodgements, for which to date the Tribunal has not been able to obtain any satisfactory explanation, may also be related to payments to or for the benefit of Mr. Haughey. The third subdivision involves the consolidation of evidence already given to the Tribunal at its public sittings concerning payments made or accounts held which appear to have been made to, or held for the benefit of Mr. Charles Haughey. To date the evidence concerning those payments, or those accounts, has been obtained mainly from persons other than Mr. Haughey himself. In some cases, for instance in the case of payments made to connected persons, the Tribunal has had the benefit of assistance from members of Mr. Haughey’s family. Also, in the case of access to some, though not all of the relevant bank accounts, the Tribunal has had the benefit of a waiver from Mr. Haughey and from other members of his family. From the evidence given to date in relation to these matters, it would appear that very substantial sums of money were paid to Mr. Haughey, or into accounts which appear to have been held for his benefit, over the period from 1979 and 1996. Some evidence has been made available to the Tribunal concerning the sources of these payments. That evidence deals either with the immediate source or with the ultimate sources where the payments have gone through a circuitous or involved route before terminating in an account or as a direct payment to, or for the benefit of, Mr. Haughey. The Tribunal has reviewed the available evidence concerning the sources of these payments but now believes that in order to throw further light on the sources of some of these payments and the circumstances in which all of these payments were made, the direct evidence of Mr. Haughey will be necessary. Certain other matters will also be revisited in the course of these sittings. While the Tribunal has assembled material concerning these matters, there is yet further material to be collected and the procedural steps which the Tribunal would wish to take, if at all possible, before bringing the evidence to the notice of the public cannot practically be completed in advance of this opening statement. Now, I want to deal with the itemised elements of new material that I mentioned already, and the first one I mentioned concerned Feltrim. Feltrim Mining PLC, from the information available to the Tribunal, appears to have been a company which was incorporated in March of 1988 and was floated on the Irish Stock Exchange on the 1st of April of 1988. Mr. Conor Haughey, the son of Mr. Charles Haughey, was the Managing Director of Feltrim, from the date of its incorporation which was in 1988, to 1993 when he resigned as Managing Director and appears to have had no further involvement with the company. At that time Feltrim changed its name to Minmet PLC and was rescued from what was then a fairly perilous situation by new investment and taken over by new management. Feltrim came to the attention of the Tribunal when Mr. Dermot Desmond informed the Tribunal that he had invested in the company in 1990, and that he made a loan to the company of £55,000 in mid-1991. Mr. Desmond has also informed the Tribunal that he made further investments in the company subsequent to its take over in mid 1993, that is to say after the company changed its name to Minmet PLC, and that he has made a sizable profit from his investments. The Tribunal has been informed by Mr. Conor Haughey and by Mr. Trevor Watkins, who was formally Financial Director of the company, that the proposal to establish Feltrim was that of Mr. Conor Haughey himself, who was a qualified geologist. The Tribunal understands that Mr. Haughey approached Mr. James Stafford in connection with the setting up of the company. Mr. Haughey knew that Mr. Stafford had a knowledge of public companies and the flotation of companies on the Stock Exchange. Mr. Stafford had also been involved with Atlantic Resources. Mr. Conor Haughey has confirmed that Mr. Stafford arranged for an initial meeting with Mr. Emmett O’Connell of Texas Continental Securities, a company which specialised in bringing companies to the Stock Exchange in the resources sector; and that both Mr. Stafford and Mr. O’Connell were in favour of the idea and decided to assist Mr. Conor Haughey with the launch. They also agreed to invest £100,000 each in the company. Apart from the £100,000 that Mr. Stafford invested, the Tribunal has been informed by Mr. Conor Haughey that Mr. Stafford provided a further £100,000 towards the expenses of the promotion and flotation. And Mr. Conor Haughey has stated that these monies, this £100,000, was repaid by the company after flotation. Mr. Conor Haughey has also informed the Tribunal that his initial shareholding in Feltrim was funded by a payment of £50,000 by Feltrim to a company he controlled, by the name of Geo Engineering Limited. This payment was made for a report provided by Geo in connection with its exploration and research activities. The £50,000 was applied to the purchase of 125,000 shares in Mr. Conor Haughey’s name in Feltrim. It appears that additional shares in the company were allotted to Mr. Conor Haughey in lieu of salary and expenditure paid by him or incurred by him on behalf of Feltrim. He has stated that his father, Mr. Charles Haughey, would have been the source of most of the funds used, and the Tribunal will be inquiring into the funds provided by Mr. Charles Haughey and the sources of those funds. On the flotation of Feltrim in 1988, the Board of Directors included Mr. Bernard Cahill who was Chairman, Mr. Conor Haughey who was Managing Director, Mr. Jack Stakelum, Mr. John Barnicle, Mr. Niall Haughey, Mr. Michael J O’Connor, Mr. Somerset Gibbs and Mr. James Patrick Shannon. The auditors to the company were Deloitte and Touche and the secretary to the company was Secretarial Trust Company, a company associated with Deloitte and Touche. The Tribunal has been informed and it appears from the accounts of Feltrim, that approximately one million pounds was raised on the flotation of Feltrim. The shares were offered at 40 pence and the share price doubled to 80 pence on the first day of trading but fell back steadily thereafter. In the first year of trading the Board approved expenditures of some £600,000 on various exploration ventures which unfortunately did not prove fruitful. As a result, Feltrim appears to have incurred a loss for the year in question, 1989, of £838,804. The losses continued and as of 1990 there was a deficit on the profit and loss account in excess of 2 million. On the 14th of March, 1990, the Board of Directors noted that the auditors had determined that there existed a financial situation requiring the convening of an Extraordinary General Meeting under Section 40 of the Companies Act of 1983, and it was resolved that this extraordinary meeting be convened on the 14th of March, 1990. At that time Feltrim went back to the market and sought to raise in the region of a further £300,000 to £400,000 at 32 pence per share. This appears to have been the occasion of the first involvement of Mr. Dermot Desmond in the financial affairs of Feltrim, and he subscribed for approximately 83,000 shares at 32 pence per share, amounting to an investment on his part of some £26,667. This sum of money was lodged into Feltrim’s current account on the 1st of August of 1990. Feltrim’s finances did not improve and the loss for the year 1991 was even greater, at £1,490,124. The deficit on the profit and loss account was approximately £3.5 million. Dealings in Feltrim shares were temporarily suspended on the Stock Exchange on the 3rd of June, 1992, and they did not resume until the 11th of June 1993, after the effective take over of Feltrim which had by then been renamed Minmet PLC. It seems that in mid 1991 Feltrim had entered into an agreement to extract stone from a quarry in Clonmannon, County Wicklow. Mr. Trevor Watkins, who has provided the Tribunal with a considerable amount of assistance concerning the activities of the company, has informed the Tribunal that the purpose of this agreement was to generate revenue for the company to enable it to continue trading. The company was in severe financial difficulties at the time and the haulers who had been engaged in connection with the agreement to extract stone were unpaid. It was at this time that Mr. Conor Haughey brought the condition of the company and the situation in which it then was to the attention of Mr. Dermot Desmond who agreed to provide £55,000. It also appears that around the same time Mr. Jack Stakelum, who had by then resigned as a Director of Feltrim, also provided £15,000 to the company. These monies were lodged to the company’s current account but for some reason do not appear to have been recorded at the minutes of the meetings of the Board of Directors in August and September of 1991. These advances appear to have been provided on an informal footing, and it appears that no documents were executed by any of the parties connected with them. The loans were however, recorded in Feltrim’s accounts for 1991 and were included in the overall figure for creditors. It seems that Mr. Desmond’s loan of £55,000 was converted into shares at 5p per share in March of 1992, resulting in the issue and allotment to him of 1.1 million further shares. Mr. Stakelum’s loan was also converted into shares with an initial conversion of £7,500 of debt in March of 1992 yielding 150,000 shares and a subsequent conversion of the balance of the debt in June of 1993, yielding 333,300 shares. The Tribunal has also been informed by Mr. Bernard Cahill that he provided a loan of £6,241 to the company in 1992 which was used to pay fees due to patent agents in relation to the registration of a gold extraction process license held by Feltrim. The Tribunal will also wish to examine the circumstances and the purpose for which these funds were provided. By March of 1993, Feltrim was effectively a shell and a new investor emerged from the United Kingdom who specialised in taking over such companies. Arrangements were made with all of the creditors, with the exception of Mr. Mike Murphy of Mike Murphy Insurances, on the basis that those creditors would agree to convert their debts into shares. It appears that there were discussions between the new investor and Mr. Dermot Desmond who wished to acquire a one third interest in the company. This is something the new investor was not agreeable to, but eventually Mr. Desmond did make a further investment at one penny per share, giving him a holding of approximately 10 percent of the company. Feltrim is relevant to the Tribunal’s terms of reference as a company involving persons who come within the definition of “connected persons to Mr. Haughey”. Payments to connected persons come within the Tribunal’s Terms of Reference at Term of Reference (A). The Tribunal has already heard evidence concerning payments made to connected persons in connection with the setting up, and the continued operation of, Celtic Helicopters. It will be recalled that substantial sums of money were raised for the setting up of that company from individuals who have given evidence, essentially to the effect that those monies were in the nature of contributions to Mr. Haughey or to his family. Celtic Helicopters proved in many respects to be unsuccessful, at least in its initial years and required injections of capital and other assistance from time to time. At one point, substantial sums of money were injected into the company to sustain it and these sums were provided, once again as far as the evidence goes, on a basis which would appear to suggest that they constituted contributions to the Haughey family, as opposed to genuine hard nosed commercial investments. In the case of Celtic Helicopters the initial subscriptions by contributors to the Haughey family appear to have been routed through Guinness and Mahon in such a way that the identities of the contributors could only be ascertained after a considerable amount of investigatory work. Where the very substantial later investments used to sustain the company at the time when it was in financial trouble are concerned, the investments were once again difficult to identify, although easier to ascertain than in the case of the initial investment. Many of these investments were, as you will recall from the evidence, made in unusual circumstances, notably the contributions or assistance provided by Mr. Mike Murphy and/or by Mr. David Gresty. The question which arises in the context of Feltrim is whether there are similarities between the setting up and the sustaining of that company; whether there are similarities between the way in which it was set up and operated and the way in which Celtic Helicopters was set up and operated; whether the initial contributions and/or the subsequent assistance to the company ought to be characterised in the same way as the initial contributions to Celtic Helicopters and the subsequent attempts to sustain that company when it ran into trouble; or whether in fact, in the case of Feltrim, the involvement of the individuals that I have already mentioned was of a more genuinely or obviously commercial nature. I now want to pass on, Sir, to evidence in connection with Princes Investments Limited. Although Princes Investments has been mentioned in evidence, the material which has now come to the attention of the Tribunal is mainly new material, but it is relevant to something which the Tribunal was dealing with when the matter was last mentioned, that is when the Tribunal was dealing with the operation of or the manner of operation of the Ansbacher accounts. Princes Investments Limited is a company associated with Mr. John Byrne and Mr. Thomas Clifford and traded mainly, as far as can be seen, as the Mount Brandon Hotel, Tralee, County Kerry. Mr. Byrne and Mr. Clifford, with Mr. Dennis Foley, were, it will be recalled, directors of Central Tourist Holdings, a company whose banking affairs were the subject of evidence at those earlier sittings I mentioned at which the aspects of the operation of the Ansbacher accounts were canvassed. That earlier evidence concerned a loan to Central Tourist Holdings from Guinness and Mahon. From the evidence given it appeared that the loan which had been granted by Guinness and Mahon was secured by a back-to-back Ansbacher deposit. The loan was discharged in 1985 by a payment or a transfer from an Ansbacher account in Guinness and Mahon. None of the directors of the company, that is Mr. Byrne or as far as we can see Mr. Clifford, or Mr. Foley, who had indirectly benefitted from this payment, could explain how the loan came to be repaid or how the repayment came to be made from an Ansbacher account. Mr. Byrne’s evidence was that the entire matter was a mystery to him. Mr. Foley gave evidence to the effect that he knew nothing about the discharge of the loan and was in fact of the view that the loan continued to be outstanding. A questionable aspect of this loan was that after it had been repaid, documentation was generated in Guinness and Mahon which appeared to have been calculated to give the impression that the loan was still outstanding. What the documentation in question indicated was that a sum equal to the amount of the loan at the time it was discharged was drawn down by way of a new loan, and credited to a new current account. At one point Messrs. Deloitte and Touche, accountants and auditors to the company, were in the process of negotiating the company’s outstanding indebtedness to the Revenue Commissioners. Evidence was given that in the course of those negotiations documents were produced to the Revenue Commissioners indicating that the company, Central Tourist Holdings, had a loan outstanding from Guinness and Mahon. Documentation was also produced at those sittings containing Guinness and Mahon’s response to a pro forma request from the accountants for information concerning the state of the company’s accounts with the bank. The pro forma documentation referred to the company’s then indebtedness represented by a substantial debit on a loan account. In other words, the response by Guinness and Mahon to the pro forma request for information concerning the company’s indebtedness consisted of a certificate to the effect that the company was indebited to the bank to a substantial sum represented by the new loan which had been drawn down, but omitted any reference to the corresponding credit on the new current account. While the certificate, therefore, gave the impression that Central Tourist Holdings was indebited to Guinness and Mahon, in fact, at the time of the response to the pro forma request, the company’s net position was in fact one of no debit and no credit. This formula “security is considered adequate”, as has been stated in evidence on numerous occasions was used to describe loans secured by Ansbacher backing deposits. The original formula used for this purpose was slightly different at an earlier point in the life of the Ansbacher operation. The expression which featured most commonly in the documents available to the Tribunal from the earlier period of the Ansbacher operation was “suitably secured”. You will recall the evidence that following serious concerns expressed by the Central Bank concerning this type of lending and following assurances by Mr. Desmond Traynor and his associates that lending secured in this way would cease, a different expression was used, it would appear so as not to attract the continuing attention or scrutiny of the Central Bank. This is the new expression which was used in the case of the Princes Investments Limited loan. The loan was a Sterling loan on account number 05508002. It appears that the last statement for this loan shows the balance as of the 31st of December, 1984, at Sterling £172,138.16. The loan it seems was cleared in full on the 4th of September of 1985. Guinness and Mahon Bank internal documentation for that date shows that a sum of £186,986.82 was transferred from Guinness Mahon Cayman Trust/ College Call account number 06040454 and was credited to the Princess Investments Limited Sterling account. That sum £186,986.82 appears to have been the amount at which the loan stood at the relevant time that it was cleared. The Central Tourist Holdings Limited loan which was mentioned in earlier evidence was also cleared on the 4th of September 1985 and was also cleared with funds transferred from the self same Guinness Mahon Cayman Trust college account. That account is effectively an Ansbacher account. And you will recall that, although the term “Ansbacher account” doesn’t accurately describe each and every account kept by Mr. Desmond Traynor associated with his Cayman banking activities while he was in Guinness and Mahon and while he was running the Ansbacher operation, it has been used in the course of the sittings of this Tribunal and the McCracken Tribunal to describe a large number of accounts, all of which were associated with activities carried on by Mr. Desmond Traynor and his associates. Now, in the case of the Princes Investments Limited account, as in the case of the Central Tourist Holdings loan, after the repayment of the loan statements were once again generated in such a way as to give the impression that Princes Investments, notwithstanding the discharge of the loan, was still indebited to Guinness and Mahon. Once again, as in the case of Central Tourist Holdings, certificates were generated by Guinness and Mahon showing debit balances on accounts of Princes Investments at various times, when in fact there was no true indebtedness on the part of Princes Investments to Guinness and Mahon. In other words, on each occasion, and in this case there were two occasions, that the bank certified a state of indebtedness between itself and Princes Holdings, there was in truth, no debt between the two parties. Mr. John Byrne, a Director of the company, has been asked to provide the Tribunal with information concerning this loan, and the manner in which the loan was repaid. He has indicated that he has no knowledge of the repayment of the loan on the 4th of September, 1985, and that he has no knowledge of the repayment of the loan with funds transferred from an Ansbacher account. He has, however, indicated that to the best of his knowledge the loan was repaid in July of 1987, and that a payment of £260,000 by Princes Investments in July of 1987 was for the purpose of repaying the loan due to Guinness and Mahon. As a result of inquiries made by the Tribunal and from information made available to the Tribunal by Guinness and Mahon and by Allied Irish Banks, it would appear that on the 23rd of July of 1987 a sum of £260,000 was credited to Amiens Securities Limited number 1 account, 10407014. This £260,000 credit appears to have emanated from an account in Tralee, and from information made available by Allied Irish Banks, there was what appears to be a related debit in the sum of £260,000 on the Princes Investments Limited account at the Castle Street, Tralee, branch of that bank. While there appears, therefore, to have been a debit of £260,000 from the Princes Investments account in Tralee, that debit was not represented by a payment to Guinness and Mahon in discharge of any indebitedness on a Guinness and Mahon loan account of Princes Investments and, on the contrary, there appears to have been a credit or a corresponding credit, if you like, to an account of Amiens Securities Limited in that sum. There was however, no transfer, as far as the Tribunal can see, from any such Amiens Securities Limited account of a sum of £260,000 to Guinness and Mahon itself or to any other account in Guinness and Mahon. Now, while I will be coming back to this in a moment, the first document, if we could just have it a moment, which was on the overhead projector a minute ago, was in the nature of a banker’s payment, which is a form of payment or transfer of monies by an instrument between one bank and other bank. That instrument for £260,000 represents the proceeds of what would appear to have been a debit to the Princes Investments AIB account in Tralee, but while one would have expected that £260,000 to be paid to Guinness and Mahon, as the next document I will put on the overhead projector will show, it did go into Guinness and Mahon but not into Guinness and Mahon’s own coffers but as far as can be seen, into an account of Amiens Securities Limited. Accounts which, as we know, were under the control of a Mr. Desmond Traynor. You will see the last entry on that account is for that amount of £260,000. From other information made available by Mr. John Byrne, it seems that a sum of £100,000 was loaned by Mr. Byrne’s other company, Carlisle Trust Limited, to Princes Investments and that a further sum of £100,000 was provided by Clifford and Sons Limited, a company associated with Mr. Clifford, to Princes Investments, and that the balance of £60,000 to make up the repayment was provided by Princes Investments from its own resources. Mr. Byrne however, has not been able to throw any light on the unusual feature of these payments, which purports to have been made in discharge of indebtedness of Princes Investments at a time when so far as the record in Guinness and Mahon goes, Princes Investments was not in anyway indebited to that bank. Mr. Thomas Clifford, a Director of Princes Investments has not yet responded to the Tribunal’s requests for assistance with any explanation of, or any documentation in relation to the unusual feature of these payments. Nor has Princes Investments itself provided any information to enable the Tribunal to clarify these unusual transactions. As I mentioned a moment ago, the payment of £260,000 was or at least must have been initially made by way of cheque. That cheque was converted into a banker’s payment which, as I said, is a form of transfer of funds from banks, a form of payment from one bank to another bank. It is usually resorted to by a bank wishing to obtain immediate value for or urgent clearance of an instrument. It is also a form of payment that might be resorted to by the payee of a cheque who is desirous of obtaining value for a cheque on an urgent basis, that is to say, without going through the usual clearing process. This information, which has now been provided to the Tribunal concerning this cheque, should be viewed in the context of information provided and evidence given at the Tribunal’s last sittings on the question of the general operation of the Ansbacher accounts and from the unusual manner in which this transaction and the Central Tourist Holdings transaction were carried out, a number of questions arise. Firstly, if Princes Investments had an indebtedness to Guinness and Mahon, which it envisaged clearing by way of a cheque for £260,000, it is hard to say why, bearing in mind that there was no actual liability to Guinness and Mahon, there should have been any urgency on the part of Guinness and Mahon to obtain value for the payment made. Secondly, if Princes Investments was indebted to Guinness and Mahon in the sum of £260,000 and drew a cheque in favour of Guinness and Mahon for that sum with a view to discharging that liability, there being no liability, in fact in Guinness and Mahon there had to be some intervention on the part of the staff of Guinness and Mahon, at whose direction it is not clear, to intercept this payment. A further intervention was required to arrange for the collection of the amount due on the cheque by way of a banker’s payment, and bearing in mind that a banker’s payment involves a transaction as between one bank and another, the question is how (or why) value was obtained for the banker’s payment, not in favour of Guinness and Mahon to whom the debt was owed, according to Princes Investments Limited, but to Amiens Securities Limited, a third party. The steps taken to intervene in what appeared to be a straightforward discharge by Princes Investments, of a so-called indebtedness to Guinness and Mahon involving the interposition of a banker’s payment and the crediting of another account altogether, caused the source of the funds, that is to say the source of the £260,000, to be almost completely obscured. That will be readily understood when the evidence is given that in order to identify the source of the £260,000 bankers payment, Allied Irish Banks had to examine every single substantial debit in or around that amount and in or around that time in the State, in its own banking system, that is. If the books of Princes Investments were available or if the directors were able to assist, it might be possible to suggest an explanation for these events which did not raise so many questions. What the information to date suggests (and this is an issue that will have to be taken up with the directors or any other persons having knowledge of the operation of the accounts of Princes Investments) is that a holder of an Ansbacher account appears to have conferred a benefit on Princes Investments by discharging that company’s indebtedness to Guinness and Mahon; and the question is whether the payment of £260,000 into an account of Amiens Securities was intended to recoup that Ansbacher account holder or the person entitled to those funds in an Ansbacher account for having discharged that debt. It may of course, be that the payment of £260,000 was wholly independent of the earlier discharge of the indebtedness, but that is an issue that the Tribunal will have to address in the course of the evidence. The third new item I want to deal with concerns the company which I mentioned at the outset, Wytrex, as the route for a payment which appears to have come from Mr. Bernard Dunne to Mr. Haughey. Following an application in the High Court last year by the Minister for Enterprise and Employment, the High Court made an order appointing an Inspector under the Companies Acts to carry out inquiries into the affairs of Ansbacher (Cayman) Limited. In those proceedings the High Court further ordered that a portion of the affidavit relied on by the Minister, together with certain of the exhibits mentioned in the affidavit, should be sent to this Tribunal. From those exhibits it appears that a sum of £200,000 Sterling was routed through Henry Ansbacher and Co. (London) to Guinness and Mahon in Dublin for onward credit to an account number 13154602. This is the account which has already been mentioned in evidence in connection with various Ansbacher transfers. The documents made available on foot of the High Court Order showed that this payment was directed by a company known as Wytrex (Far East) Limited. This is a company, the name of which at least is known from evidence given at the McCracken Tribunal to have been associated with Mr. Bernard Dunne. Although the company known as Wytrex had come to the attention of the McCracken Tribunal, it appears that the documents identified by the authorised officer did not form part of the evidence given at that Tribunal, as those documents were generated in London and not in Guinness and Mahon in Dublin. The transaction involved the routing of funds to an account in London, Ansbacher Cayman account with Henry Ansbacher, account number 190017 -101. That account number has already featured in evidence given at sittings of this Tribunal, and it will be recalled that it is the account through which a payment of £100,000 Sterling by Mr. Dermot Desmond was routed to Mr. Charles Haughey in September of 1994. From the fact that this account appears to have been used to route payments to Mr. Haughey and the fact that the source of the payment was the Wytrex account already mentioned in the McCracken Tribunal, and also from the fact that the payment was marked for the ultimate attention of JD Traynor, it seems reasonable to inquire whether this could have been a payment for the benefit of Mr. Charles Haughey and whether the payment was one associated, like other payments in respect of which evidence was given, with Mr. Bernard Dunne. The documents made available by the authorised officer were brought to the attention of Mr. Dunne and Mr. Dunne has provided the Tribunal with a statement in connection with the matter. I think I will just very briefly put the documents on the overhead projector. The first document on the overhead projector is a telex communication from Ansbacher, that is to say from Cayman, to Henry Ansbacher and Co. in London. It is dated the 28th of September, 1990. The left-hand side of the available copy is not as clear as it should be. The legend is as follows: “For value 3rd or 4th of October, 1990”. Then manuscript: “Or whenever.” “You will receive £200,000 Sterling marked for the attention of JD Traynor and for credit to our account 190017-202. This account is closed as you know, so please credit the funds to our Sterling current account 190017-101”. Now if I could stop there for a moment. This fax transmission was from Ansbacher (Cayman) in the Cayman Islands to London in September of 1990 and is effectively alerting London to the fact that a payment for £200,000 would be routed to London for the credit of Ansbacher Caymans’ account, and that that payment would be marked for credit to a particular account and for the attention of Mr. JD Traynor, who was not, of course, in London. It was also instructing London to bear in mind that the account to which this payment was being directed, or through which it was being routed had an incorrect account number because the account number “202” was in respect of an account which had been closed, and so effectively amended the instruction and directed that the sum in question be credited instead to account 190017-101. The account number 190017-202 is an account number, or details of an account number, which featured in the evidence given to the McCracken Tribunal and was an account number, details of which were relayed by the late Mr. Traynor to Mr. Noel Fox, in connection with another payment to be routed to Mr. Haughey from funds provided offshore by Mr. Bernard Dunne. The document goes on to say: “Immediately upon receipt of the funds, please debit our account 190017-101 and transfer £200,000 Sterling to Guinness and Mahon Limited in Dublin, account 13154602”. The next document on the overhead projector is dated November of 1990 and is a telex from Ansbacher (Cayman) to Henry Ansbacher in Dublin. Now, the last telex or the telex that I have just had on the overhead projector was from a Mr. Dotchin and it requested London to advise either Mr. Dotchin; and the “Mike” referred to, appears to be Mr. Michael Day. It is from Mr. Michael Day that this telex came in November of 1990. It directs London to debit the Sterling account 190017-101 with £200,000 and to transfer it to Dublin. So it simply confirms that there must have been contact between London and Cayman, and a repetition of the earlier instruction from Cayman to London to transfer the money to Dublin for the attention of Mr. Traynor and for the credit of the Ansbacher account in Guinness and Mahon. The next document is an internal banking document indicating some of the routing of this payment, and it identifies the initiator of the payment; it is the fourth last entry from the bottom; as Wytrex (Far East) Limited; and identifies the payee as the account I have already mentioned, 190017-202. A mistake which resulted in, or which necessitated the intervention of Ansbacher to correct the account receiving the money to account number 101. The next document confirms the application of the credit. The next document shows the credit of £200,000 to the 602 account, which is the account number on the left-hand side, the Ansbacher Cayman Call deposit account as of the 20th of November, 1990. Now I mention that these documents had been brought to the attention of Mr. Dunne and he has informed the Tribunal that the first time he became aware of the payment was when it was brought to his attention by the Tribunal in September of 1999. Mr. Dunne has informed the Tribunal that while he has no direct knowledge nor recollection of the payment, he accepts that if the payment came from Wytrex it could only have been initiated by him. He has also informed the Tribunal that although he has no recollection of the payment, he can only assume that the purpose for which it would have been made was exactly the same as he has indicated elsewhere; namely that he had taken on an undertaking, or agreement, to pay monies to Mr. Haughey and that this payment was part of a series of payments that he had agreed to make to Mr. Haughey. As Mr. Noel Fox was, as I have already mentioned, involved in dealing with Mr. Traynor in connection with a series of payments made by Mr. Dunne for the benefit of Mr. Haughey, Mr. Noel Fox was also asked to assist the Tribunal with any information he had in relation to this payment. He has informed the Tribunal that he has no knowledge concerning the payment and that he was not involved in any communications with Mr. Bernard Dunne or with Mr. Traynor in relation to the payment, and says that like Mr. Dunne, he was unaware of its existence until informed by the Tribunal. He has, however, informed the Tribunal that there are similarities between the information given to him, and of which he made a handwritten note in connection with the payment made by Mr. Ben Dunne in February of 1990, and the details of the account number through which this £200,000 payment was routed. The account number given to him in connection with the payment of February of 1990, which I mentioned a moment ago when the documents were on the overhead projector, and of which he made a note, was 190017-202 at Henry Ansbacher. The London documents made available in connection with this Wytrex payment refer to the routing of the payment through an account number 190017-101 in place of the account 202. Which, as I mentioned in the course of referring to the documents on the overhead projector, had been closed by that time. The question, of course, is how this payment came to be routed through the same bank and through what was apparently the same account and along the same route without the intervention of either Mr. Fox or Mr. Traynor, or some other person to whom the relevant information must have been conveyed. Mr. Dunne has informed the Tribunal that he cannot say whether Mr. Fox was involved. Mr. Fox has informed the Tribunal that he received no further approaches from Mr. Traynor after February of 1990, and that he, therefore, received no approach from Mr. Traynor in connection with this November of 1990 payment. These, and the issues thrown up by these matters or by these responses, will have to be pursued by the Tribunal in the course of its sittings. Now, I want to turn to two or three areas in which a significant amount of evidence has already been given. The first area is in connection with the fund set up to discharge the medical expenses of the late Mr. Brian Lenihan. Since the Tribunal last dealt with this matter some further information has became available concerning the number of contributions to the fund, the size of those contributions and also concerning the manner in which the funds may have been raised. Information was brought to the attention of the Tribunal in or about November of 1999 by Dr. Eamonn de Valera, a Director of the Irish Press Group. Dr. de Valera has provided the Tribunal with a Memorandum of Evidence from which it appears that some time in 1989 he received a telephone call from a Mr. Dan McGing, who was then Chairman of the Agricultural Credit Corporation, requesting a contribution from Irish Press PLC to fund the medical expenses for the late Mr. Lenihan. Mr. McGing suggested to Dr. de Valera that the Irish Press make a donation in the sum of £10,000. Dr. de Valera has informed the Tribunal that if he agreed to make a payment in the sum of £10,000 that a cheque in that amount was drawn on an Irish Press account and made payable to Coopers and Lybrand and then sent to Mr. McGing. Coopers and Lybrand were at that time the auditors to the Irish Press PLC and Mr. McGing had been a partner in Coopers and Lybrand – although by that stage he had ceased to be a partner, he had not entirely severed his relationship with the firm of accountants. The Tribunal has obtained a statement from Mr. McGing but it would appear that all of the relevant documentation concerning the processing of this cheque is under the control of Price Waterhouse Coopers, the firm which has succeeded to the partnership of Coopers and Lybrand. Price Waterhouse Coopers has informed the Tribunal that it is in the process of making inquiries and carrying out searches and having inquiries made with its bankers with a view to providing the Tribunal with information concerning the manner in which the payment was treated in the accounts of Irish Press PLC and the manner which the payment was routed through to the fund set up for Mr. Lenihan. As and when this information becomes available the Tribunal will wish to examine it with a view to ascertaining whether this payment was lodged to AIB Baggot Street or otherwise applied towards the discharge of Mr. Lenihan’s medical expenses. The Tribunal has also been in contact with another contributor to the fund set up for Mr. Lenihan’s medical expenses and once a number of practical procedural difficulties have been ironed out his evidence may also became available to the Tribunal. In addition, within the last few days the Tribunal has obtained from Mr. Paul Kavanagh, who has already given evidence in connection with the fund, a document containing a list of individuals who, it appears, were approached or who it was envisaged would be approached in connection with the fund. This document also contains information which may indicate the sums of money contributed by some of these individuals, although at this stage the Tribunal cannot be certain that this information might not, in fact, indicate sums anticipated, as opposed to actually obtained from these individuals. This material is currently being investigated and while it is undoubtedly relevant to the issues which have already been canvassed in relation to this topic, it would be preferable not to identify any of the contributors until such time as further inquiries have been carried out, but it will be mentioned at a later point in the course of these sittings. The next matter I want to mention by way of a tidying up of something that was mentioned in earlier evidence relates to NCB Stockbrokers. At the sittings last December evidence was given to the Tribunal concerning the operation of the account at NCB Stockbrokers Limited in the name of Aurum Nominees on behalf of a company known as Overseas Nominees Limited. This was the nominee holding company of Ansbacher (Cayman) Limited and was associated with the late Mr. Desmond Traynor. From the evidence given last December it appears that the investment account, that an investment account in the name of Aurum Nominees was opened in or about the month of June 1988. The account was ultimately closed in or about the month of September of 1995. Evidence was given that on the closing of the account, the balance of the account on the instructions of Mr. Padraig Collery, (Mr. Traynor at that time was deceased), was remitted to an account at Irish Intercontinental Bank in the name of Hamilton Ross. Hamilton Ross is a company which has been frequently mentioned in evidence given to the Tribunal. It is a Cayman company within the extended meaning of the term “Ansbacher” as used in the evidence given to this Tribunal and in evidence given to the McCracken Tribunal. Evidence was also given last December that the monies credited to this account were ultimately credited in the memorandum records kept by Mr. Padraig Collery in the name of the Sterling S8 account. This is an account which appears to have been used exclusively for the benefit of Mr. Charles Haughey. The evidence given so far seems to suggest that as the proceeds from the account on the closing of the account were remitted to an account for the benefit of Mr. Charles Haughey, the entire Aurum Nominees No. 6 Account may have been operated for his benefit between 1988 and 1995. Since the evidence was last given on this matter, the Tribunal has nevertheless endeavored to establish the source of the funds used to operate this account. As a result of inquiries carried out by NCB Stockbrokers and information resulting from those inquiries made available to the Tribunal, it would appear that the funds ultimately credited in the books of NCB Stockbrokers to the Aurum Nominees account were received into an NCB Sterling account with the Bank of Scotland in London, in two tranches of £175,000 Sterling on the 7th of June 1988 and £125,000 Sterling on the 18th of August of 1988. From information made available by NCB it seems that the Royal Bank of Scotland current account into which the funds were received was not used by NCB for the settlement of purchases made on behalf of clients; but rather was used for the payment of Sterling expenses incurred by NCB Stockbrokers as members of the London Stock Exchange and was funded from NCB’s own funds, that is from commissions received from NCB’s Bank of Ireland Sterling account. It seems that the receipt of funds into this account in this way was highly unusual. The funds in question were remitted to the NCB account from Guinness and Mahon. From documents made available from Guinness and Mahon, it would appear that each of the credits to the NCB account with the Royal Bank of Scotland amounting in all to some £300,000 Sterling was funded by debits to an Ansbacher Sterling account with Guinness and Mahon, the “602” account I have already mentioned. The Tribunal has not been able to obtain copies of the memoranda kept by Mr. Padraig Collery of the S8 Sterling account for the period covering the opening of the Aurum Nominees No. 6 Account, as opposed to the closing in 1995. The Tribunal’s information is that the available documentation concerning the operation of this account commences only in September of 1992. The Tribunal cannot say, therefore, with absolute certainty, that these funds, although ultimately remitted by NCB to an Ansbacher account, from which they were then credited in the memorandum system to the S8 Sterling account, emanated from that S8 account. So far as the information to hand goes, it would appear that the main Ansbacher account, the 602 account was the immediate source of these funds to NCB. Whether the funds in question, when debited from that 602 account, were reflected in an equivalent debit from another account under the control of Mr. Traynor for the benefit of Mr. Haughey is a matter which will have to be pursued at these sittings. The second, or the next matter I want to mention, and to which reference is already made is the Amiens Securities Limited No. 1 current account, 10407014. This is the Amiens Securities Limited account which has featured time and again in the course of the Tribunal’s evidence. It is the account mentioned in the context of the £260,000 payment from Princes Investments which I mentioned at the outset of this opening statement. It is also the account into which the cheques which have became known as the “Dunnes Stores bearer cheques” amounting in all to some £32,000 were lodged. It is also the account that the proceeds of the Tripleplan cheque were paid and it is the account through which the various loans for PV Doyle, but which appear to be for the benefit of Mr. Charles Haughey were discharged. A number of debits were also made to this account which appear to match credits to the Haughey Boland No. 3 account, the account from which payments in connection with the operation of the bill paying service by that firm of accountants were made on behalf Mr. Haughey. The Tribunal has continued to examine lodgements to and withdrawals from this account. In particular a number of lodgements to it in 1987 in or around the time of the General Election and amounting, in all, to £106,800 have been examined. A common feature of these 11 lodgements is that they were all cash lodgements and all of them in round sums. A number of other lodgements made in 1987 and 1988 have been examined, one of which I have already mentioned, the £260,000 lodgement connected to the discharge, or apparently connected to the discharge of the Princes Investments loan from Guinness and Mahon. It would also appear from information made available by Guinness and Mahon that there was a lodgement to this account of some £50,000 on the 18th of February 1987, not in cash but by way of a cheque drawn on the Bank of Ireland, Rotunda Branch on the account of Skellig Investments Limited. Skellig Investments is a company associated with Mr. John Byrne. You can see on the overhead projector that the cheque for £50,000 is signed by Mr. Byrne. It also appears to have been written by him. Mr. Byrne has informed the Tribunal that Skellig Investments Limited is an unlimited company which was incorporated by him in 1981. His purpose in operating this company was to use it for non-trading purposes connected with his horse racing interests. As it was an unlimited company, accounts were not prepared. Mr. Byrne has said that he has no specific recollection for drawing the cheque for £50,000, but he is satisfied that he did draw the cheque, and further, that having made it available to Guinness and Mahon he would have handed it or given it to Mr. Traynor; but that at a remove of 12 years he can not indicate what the payment was for. He has also indicated that while he accepts that the cheque was lodged into the account of Amiens Securities, he was not aware of that company until informed of its existence by the Tribunal. A question which arises is whether Skellig Investments had any indebtedness to Guinness and Mahon which would have warranted the payment of what was, in 1987, a very substantial sum of money to that bank. In other words, the question is what occasion would Mr. Byrne have had to write a cheque such as this on the account of a company such as this, (i.e. a non-trading company) And why, in those circumstances, an occasion would have arisen for the handing of such a cheque to Mr. Traynor? And why, ultimately, a cheque such as this handed to Mr. Traynor in those circumstances would have been lodged to an account operated for some of the purposes I have already mentioned? That is to say, for purposes connected with what appears to have been the conferring of considerable benefits on Mr. Charles Haughey. There were two other significant lodgements to this account which have attracted the attention of the Tribunal. One on the 22nd of February of 1988 in the sum of £195,000, and another on the 24th of February, 1988, in the sum of £49,700. In total these lodgements amounted to £244,700. The transfer of these funds from the Bank of Ireland brought the credit balance on this Amiens Account to £302,950. The next entries on the account are on the 26th of February of 1988, when there were two withdrawals amounting to £174,494.67 in respect of the transfer of monies to clear the No. 1 and No. 2 accounts on the bank’s book in the name of the late Mr. PV Doyle. Now, it will be recalled from earlier evidence that these loans were raised in the name of Mr. Doyle for the benefit of Mr. Haughey. And it would appear that Mr. Traynor, after the death of the late Mr. PV Doyle, informed Mr. Doyle’s estate that it was the responsibility of the estate to discharge these loans. At that time, however, the loans had already been discharged by the two transfers that I have just mentioned. The Tribunal has endeavoured to identify the source of the Bank of Ireland credits used to fund these transfers, but to date has been unable to obtain any accurate information from the bank. The Tribunal will wish to pursue with the bank the possibility that (as one might expect, if the Doyle estate provided funds intended to discharge these loans) those funds were ultimately used to recoup the Bank of Ireland account from which the £174,494 (part of the £244,700) emanated; or some other account in Guinness and Mahon to which that recoupment should have gone. From the Tribunal’s examination of the Amiens Account there would appear to be no debit in that amount, that is no transfer from that account to the Bank of Ireland or to any other account in an amount equivalent to the amount used to pay off the loans taken out in the name of Mr. PV Doyle, that is to say £174,494 and some odd pence. Now I want to pass on, Sir, to the consolidation of evidence already given concerning the payments made to, or accounts which appear to have been held for the benefit of Mr. Charles Haughey. Since the work of this Tribunal began and information concerning what appear to have been payments to or accounts held for the benefit of Mr. Haughey became available, queries have been addressed by the Tribunal to Mr. Haughey concerning these payments or accounts. Some of this information became available to the Tribunal otherwise than on foot of orders made by the Tribunal. In other words, it was made available to the Tribunal on a voluntary basis. However, some of it became available at an early stage, on foot of orders which were subsequently quashed by the Supreme Court. Following the decision of the Supreme Court in July, 1998, a number of queries were addressed to Mr. Haughey arising from information which had been made available voluntarily. Thereafter the Tribunal continued to make available to Mr. Haughey information relevant to the Tribunal’s Terms of Reference, information which had after that date been obtained, either voluntarily or on foot of orders made against individuals or entities for the production of documents. There has been a voluminous correspondence between the Tribunal and Mr. Haughey. The main correspondence raising queries or bringing information to the attention of Mr. Haughey for comment by him, was of two kinds. Firstly, on every occasion upon which the Tribunal sat to hear evidence, the relevant books of documents intended to be adduced in evidence were brought to the attention of Mr. Haughey, as were the various memoranda of evidence or statements made by any intended witnesses. These documents brought to the attention of Mr. Haughey run in to some thousands of pages. However, there is no question of Mr. Haughey having been furnished with a huge volume of documents on any one occasion. They were made available to him at the relevant times that the queries arose or at the relevant times that the documents were sent to any other parties entitled to notice of them in advance of the Tribunal’s sittings. Apart from letters, and sending the various books of documents and memoranda of evidence or statements of intended witnesses to Mr. Haughey in advance of sittings, there was also a considerable number of letters to Mr. Haughey seeking his assistance in relation to matters arising in the course of the Tribunal’s private investigatory work. Mr. Haughey has formed a view to the effect that the Tribunal was not entitled to raise queries with him on what he regarded as a piecemeal basis. The Tribunal has however, taken a different view. It is the Tribunal’s view that on every occasion that they felt that Mr. Haughey’s opinion or assistance would be of value, he was written to and informed of the Tribunal’s request for assistance and information. 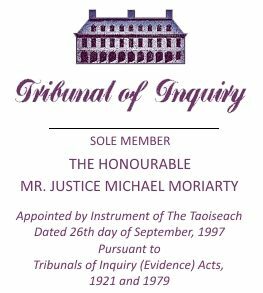 These requests for assistance, concerning certain matters which have now become the subject of evidence of the Tribunal’s sittings, were contained in the main in some 32 letters between August of 1998 and March of the year 2000. Many of these letters were extremely lengthy and set out in considerable detail the basis upon which these queries were being addressed to Mr. Haughey so that he could be in no doubt as to the assistance that the Tribunal believed he could provide. The Tribunal has now determined to proceed to insist on the attendance of Mr. Haughey to deal with the queries arising from the many matters drawn to his attention in this lengthy correspondence and to deal with matters arising in the course of the evidence over the past year and a half. In a recent letter in advance of, and in anticipation of, requiring the attendance of Mr. Haughey to give evidence (and, there is no suggestion that Mr. Haughey has indicated that he will not give evidence) the Tribunal wrote to Mr. Haughey drawing together for his assistance and so as to provide him with some guidance as to the more specific requirements of the Tribunal, a large amount of information which has already became available in the course of the evidence heard and the documents made available at the sittings of the Tribunal, relating to what appear to have been payments made for his benefit, or accounts held for his benefit, or funds made available for his use. The Tribunal has now consolidated the information available in connection with a number of funds or payments as follows: Firstly, in connection with the AIB loan which was in excess of 1 million pounds in 1979 at the time of its discharge on foot of a compromise agreement entered into at the end of that year at the beginning of 1980. Secondly, in connection with Guinness and Mahon accounts in the name of Mr. Haughey. Thirdly, in connection with the PV Doyle loans for the benefit of Mr. Haughey. Fourthly, in connection with payments by Mr. Fustok. Fifthly, in connection with the bearer cheques drawn on Dunnes Stores. Sixthly, in connection with a Cayman Island loan to Mr. Haughey. The seventh item was in respect of payments made in connection with the purchase and repair of Celtic Mist. The eighth item in respect of the Aurum Nominees No. 6 account. The ninth item is in respect of the ACC loan cleared off from funds provided by benefactors. The tenth item is in respect of the Haughey Boland expenditures, through the bill paying service. The 11th item referred to is the payments made through the bill paying service operated by Jack Stakelum. The 12th item relates to the “S” Account balances. The 13th item related to the Dunnes/Carlisle payments. The 14th item related to the Dermot Desmond payments in 1994 and 1996. The 15th item related to lodgements to the National Irish Bank up to the 31st of December of 1996. And the 16th item related to the Wytrex payment I have just mentioned. The Tribunal has examined the evidence given to date in relation to all of these items with a view to ascertaining, in approximate terms, the amount of the funds available to or the payments made to, or for the benefit of Mr. Charles Haughey between 1979 and 1996. In arriving at an overall approximation, the Tribunal has not taken into account funds made available to Celtic Helicopters nor has it taken into account funds which may have been channelled through or which may have emanated from the Leader’s Allowance Account. These two separate items will be dealt with at a later stage in these sittings. The aggregate value of the funds in question, leaving out the Leader’s Allowance funds and the Celtic Helicopters funds comes to, comes to in or about 8.5 million pounds. Now, on the overhead projector I can put a schedule showing an itemised list of these funds; and the first one is the funds of £750,000 used to discharge the AIB loan. And the next item is a sum of 1.761,629.06 million pounds comprising the funds in various Guinness and Mahon accounts in the name of Mr. Haughey. For instance that sum of 1.761,629 million includes the Tripleplan payment. The next item under the heading of the “PV Doyle loans” raised in Mr. Doyle’s name but apparently for the benefit of Mr. Haughey, comes to £301,138.92. This is all Irish currency. The next item is a sum of £50,000 representing a payment apparently made by Mr. Fustok. The next item was £32,200 being the aggregate of the bearer cheques made available by Mr. Ben Dunne in January and February of 1987. The next item, if we can just put up the document, is a Sterling loan of £400,000, together with interest of some £68,000 and ultimately £95,000, coming to a total of £563,000 Sterling. There is no evidence, so far as the Tribunal has been able to ascertain, of any repayment of that loan. The next item under the heading of “Celtic Mist” comprises the total of the purchase price, the cost of repairs and the VAT involved in the purchase and renovation or refurbishment of that vessel. The sum of £120,000 Sterling represents the purchase price and the sum of £96,829.64 represents the cost of repairs and VAT. The Tribunal has carried out inquiries with a view to ascertaining the source of the funds used to purchase the vessel but to date those inquiries have not resulted in any clarification of the ultimate source of those funds. The next item is in Irish currency, it is the aggregate of the funds in the NCB account, coming to £353,522.92. The next item, is a sum of £105,000 used to pay off an ACC loan. The next item is the aggregate of the Haughey Boland expenditures in respect of a bill paying service operated by that firm of accountants on behalf of Mr. Haughey and coming in total to the sum of £1.407,000 between 1985 and January of 1991. The next item relates to the taking up of that bill paying service by Mr. Jack Stakelum between February of 1991 and September of 1992, it comes to approximately £627,328.46. The next item under the “S” Account balances based on information made available to the Tribunal by Mr. Padraig Collery, as of the 30th of September 1992, that is to say the end of the Jack Stakelum bill paying service, comes to Sterling £1,389,056.22. The next item in Irish currency is the Dunnes/Carlisle payments of £180,000. The next item is the payments made by Mr. Dermot Desmond in 1994 and 1995 amounting in all to £125,000. The next item is an item in respect of which evidence has yet to be lead, concerning lodgements to National Irish Bank amounting in all to £580,774.36. And the last item is the Wytrex payment of £200,000 Sterling. Now the Tribunal has not yet managed to obtain a waiver to enable it to examine the National Irish Bank lodgements. But they will ultimately, it is hoped, be produced on foot of a subpoena to produce the documents relating to the accounts. Now the total in Sterling pounds amounts to Sterling £2,493,885.86; and the total of Irish pounds amounts to £6,148,593.72. Now, no attempt has been made to reevaluate the Sterling amounts in Irish currency as at various times in which the payments were made available, but the total of the aggregate of the two figures comes to in excess of 8.5 million pounds. This aggregate sum does not include income to Mr. Haughey by way of salary or expenses in connection with the elected offices he held. There may be some overlap between the various amounts going to make up these totals, but the Tribunal, in arriving at this figure, has endeavoured to avoid double accounting. It would seem to be unnecessary to characterise this total sum as a substantial one within the meaning of the Terms of Reference. In its private investigatory work and in its public sittings, the Tribunal has endeavoured to identify the sources of all of these funds, whether in the form of payments to or of accounts held for the benefit of Mr. Haughey. The immediate source of all of these funds is fairly readily ascertainable. The late Mr. Desmond Traynor is associated with many of these payments and with many of the accounts which appear to have been held for the benefit of Mr. Haughey, or which appear to have been used for his benefit. Bank accounts under Mr. Traynor’s control or with which he was associated have also been identified as the source of some of these payments and of some of these funds, but whether there are other sources, i.e. ultimate sources, in every case is not clear. The Tribunal has, however, heard evidence from which it would appear that the ultimate source of some of these funds can be identified as in the case of payments through Mr. Bernard Dunne, Mr. Dermot Desmond, Mr. Fustok, Mr. PV Doyle, Mr. Patrick Gallagher, Dr. John O’Connell; but the Tribunal believes that Mr. Charles Haughey may ultimately be able to be of assistance in either identifying or providing evidence which may assist in identifying the sources of some of the other payments, the ultimate sources of which have not yet been identified. Of course, in the event of Mr. Haughey not being able to be of assistance, a question still arises as to the extent of his knowledge of the operation of the funds held for or used for his benefit, or of the making of payments which appear to have been made for his benefit, whether prior to the time or subsequent to the time of the making of any of these relevant payments.